Touring throughout the South during the Jim Crow era of the 1940s and 1950s, the Blind Boys flourished thanks to their unique sound, which blended the close harmonies of early jubilee gospel with the more fervent improvisations of hard gospel. In the early 1960s, the band sang at benefits for Dr. Martin Luther King, Jr., and were a part of the soundtrack to the Civil Rights movement. But as the years passed, gospel fans started to drift away and follow the many singers who had originated in the church but were now recording secular popular music. And the Blind Boys, who refused many offers to ‘cross over’ to secular music, also saw their audiences dwindle. However, the Blind Boys persevered and their time came again, starting in the 1980s with their starring role in the Obie Award-winning musical “The Gospel at Colonus,” which began a new chapter in their incredible history. It’s almost unbelievable that a group of blind, African-American singers, who started out touring during a time of whites-only bathrooms, restaurants and hotels, went on to win five Grammy® Awards, a Lifetime Achievement Grammy, be inducted into the Gospel Music Hall of Fame, and to perform at the White House for three different presidents. Few would have expected them to still be going strong—stronger than ever, even—so many years after they first joined voices, but they’ve proved as productive and as musically ambitious in recent years as they did in the beginning. In 2001, they released Spirit of the Century on Peter Gabriel’s Real World label, mixing traditional church tunes with songs by Tom Waits and the Rolling Stones, and won the first of their Grammy Awards. The next year they backed Gabriel on his album Up and joined him on a world tour, although a bigger break may have come when David Simon chose their cover of Waits’ ‘Way Down in the Hole’ as the theme song for the first season of HBO’s acclaimed series The Wire. Subsequent Grammy-winning albums have found them working with the likes of Ben Harper, Robert Randolph, Aaron Neville, Mavis Staples, The Preservation Hall Jazz Band, Allen Toussaint and Willie Nelson. In 2013 the band worked with Justin Vernon (of Bon Iver) to release I’ll Find A Way, a powerful collection of gospel and spiritual songs new and old, featuring some of the Blind Boys’ most fervent vocals as well as contributions by a new generation of Blind Boys fans, including Merrill Garbus of tUnE-yArDs, Patty Griffin, and Justin Vernon himself. In 2014 the Blind Boys released Talkin’ Christmas!, a collaboration with Taj Mahal, that continued the band’s streak of creating original and interesting work. It includes new versions of Christmas standards, covers of hidden gospel gems, and seven brand-new holiday songs featuring Money Mark on keyboards, Taj Mahal on vocals and songwriting collaborations with Stax Records soul legend William Bell. In 2017 the Blind Boys released Almost Home on the band’s own BBOA Records label, in collaboration with Amazon Music. The 12-song collection serves as a fitting capstone to a seven-decade career that has both defined the sound of the American South and pushed it forward from the 20th century and into the 21st. Almost Home was recorded over four different sessions with four different GRAMMY-winning producers in four different cities. John Leventhal recorded the Blind Boys and their band in New York City, Vance Powell in Nashville, Chris Goldsmith in Seattle, and Los Lobos' Steve Berlin at FAME Studios in Muscle Shoals. The album is composed primarily of original songs which focus on the remarkable journey of the band’s two surviving original members at the time, long-time leader Clarence Fountain (who has since passed away), and current leader Jimmy Carter. It features songwriting contributions from an exceptional collection of artists including Valerie June, North Mississippi Allstars, Phil Cook, John Leventhal, Marc Cohn, Ruthie Foster, and more. Almost Home succeeds in looking backwards, while still sounding as vital and modern as ever. Since they released their debut single, "I Can See Everybody’s Mother But Mine," on the iconic Veejay label in 1948, the Blind Boys have been hailed as "gospel titans" by Rolling Stone and have collaborated with everyone from Stevie Wonder to Prince and Lou Reed, and performed on some of the world's most prestigious stages. The New York Times said that they "came to epitomize what is known as jubilee singing, a livelier breed of gospel music," adding that "they made it zestier still by adding jazz and blues idioms and turning up the volume, creating a sound…like the rock 'n' roll that grew out of it." The New Yorker simply called them "legendary." The Blind Boys' live shows are roof-raising musical events that appeal to audiences of all cultures, as evidenced by an international itinerary that has taken them to virtually every continent. 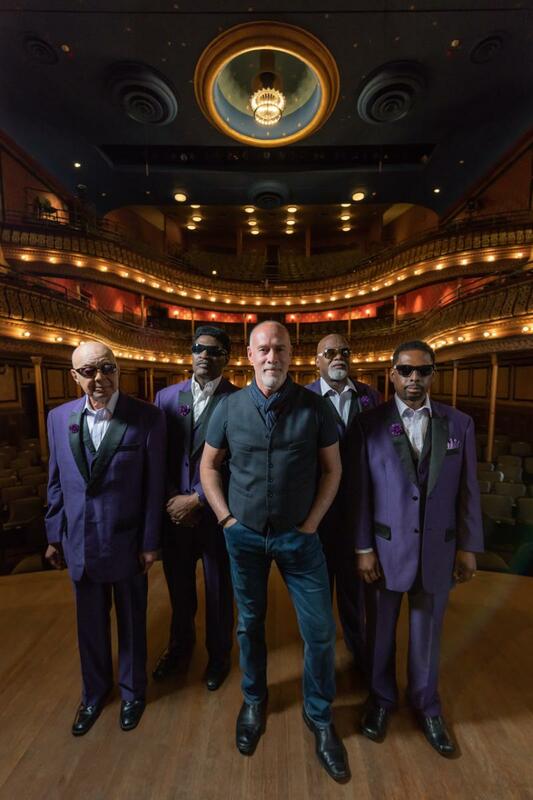 The Blind Boys of Alabama have attained the highest levels of achievement in a career that spans over 75 years and shows no signs of diminishing.